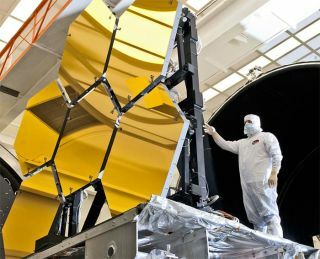 An engineer inspects the JWST's primary mirror segments at NASA's Marshall Space Flight Center in Huntsville, Ala.
Last week, the James Webb Space Telescope (JSWT) got its brain. Or at least the bit responsible for its memory. The first solid-state electronics unit that will store the telescope's data was delivered by contractor SEAKR Engineering to the telescope's manufacturer, Northrop Grumman. It's a major milestone leading up the JWST's launch since without data there would be no mission. "All the digital data Webb gathers about our universe... is stored on the onboard solid state recorder until it is delivered to the world's scientists," said Scott Willoughby, vice president and Webb program manager at Northrop Grumman. JWST isn't the first to use solid-state recorders. When Hubble launched in 1990, it stored its data on a pair or reel-to-reel tape recorders, but they didn't last long. One was replaced with a solid-state recorder during the telescope's second space shuttle servicing mission in 1997. The second was replaced during servicing mission 3A in 1999. The solid-state recorders were the same size as the reel-to-reel recorders but could hold up to ten times the amount of data. When the telescope communicates with Earth every 12 hours, the data is downloaded to NASA's Deep Space Network, this is comprised of three strategically placed centers around the world for continuous radio contact. The unit is specially designed to survive the harsh space environment, extreme cold and inevitable radiation. Chris Miller, senior vice president of Programs at SEAKR Engineering, says the company is completely confident in its hardware. It has had "a 100 percent on-orbit success rate," he said of previously flown systems, adding that "SEAKR is confident the Webb Telescope recorder will continue this tradition." The telescope is designed to play its own part in protecting and preserving its memory. JWST will use a sunshield to block the light from the sun, the Earthshine, and the moonshine -- light that can affect its optical instruments and heat up its sensitive brain. But for the shield to block all this cosmic light, the telescope needs to be at a point where all three bodies are in the same place. NASA's solution is to put JWST in a Lagrange point 1.5 million kilometers (1 million miles) away from the Earth. That's far too far for any servicing missions -- by comparison, Hubble orbits just 563 kilometers (350 miles) away -- so we better hope its solid-state recorder is truly ready for the harsh space environment. SEAKR is so confident that there won't be a backup unit on board. ANALYSIS: James Webb Space Telescope Saved? From its distant vantage point, JWST will focus on infrared light, allowing it to capture matter that is moving away from the Earth. Looking far enough away, about 13.5 billion years ago, it will look into the early universe and the dusty regions where planets and stars form. It might be easier to think of JWST as a cosmic TiVo -- video recorders use the same technology. Once it launches, the new telescope might manage to TiVo the birth of the universe for the world to see. Now that's one show no one wants to miss.